The operating history of the Rectifier Electric Locomotive dates back to the 1890s when Peter Cooper-Hewitt discovered how a mercury rectifier actually works. About the same time, Charles Steinmetz of General Electric (GE) was also working on this operating principle to identify converters for commercial and industrial applications for the process. A railway vehicle application occurred in 1906, which initiated years of rail car experimentation on a few railroad lines. Following World War II, a device known as the Ignitron came to the forefront in the experimentation of rectifier technology. The use of the Ignitron on railway units helped to open the door for electrification and modernization of railroads. The E-33 Rectifier Electric Train has a somewhat complicated history in that it first made an appearance as the Virginian EL-3a. Once the Virginia Railway merged with the Norfolk & Western, these locomotives were classified as EF-4s. That's when the New Haven Railroad bought several of them for $20,000 each. The E-33 Rectifier Electric Locomotive represents a significant point in the electrification and modernization of railroads. The M.T.H. 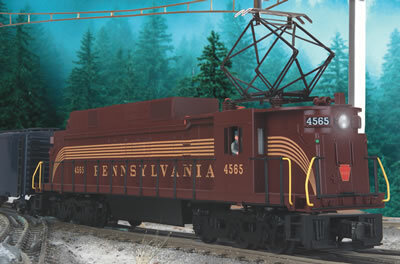 Premier Line E-33 Rectifier Electric Locomotive reflects the importance of this engine in its authentic detail and special features listed below.